It sometimes feels like I can’t leave this topic alone but that’s perhaps to be expected as I’ve seen a lot of developer interest in applications that offer a shared holographic experience and so maybe it’s right that I keep coming back to it. Additionally, when I’ve worked with developers to set up shared holograms in their applications I’ve found that they sometimes get bogged down in the enabling technologies that underpin the Mixed Reality Toolkit (for Unity) such as UNET or the networked sharing service. With that in mind, I wanted to return to the shared holograms topic again with some experiments around enabling shared holograms without using the Mixed Reality Toolkit/Unity and without using some external enabling library such as UNET or Photon. This is the first in a small series of posts taking a look at that type of experiment and it starts with thinking about what needs to be passed over the network. 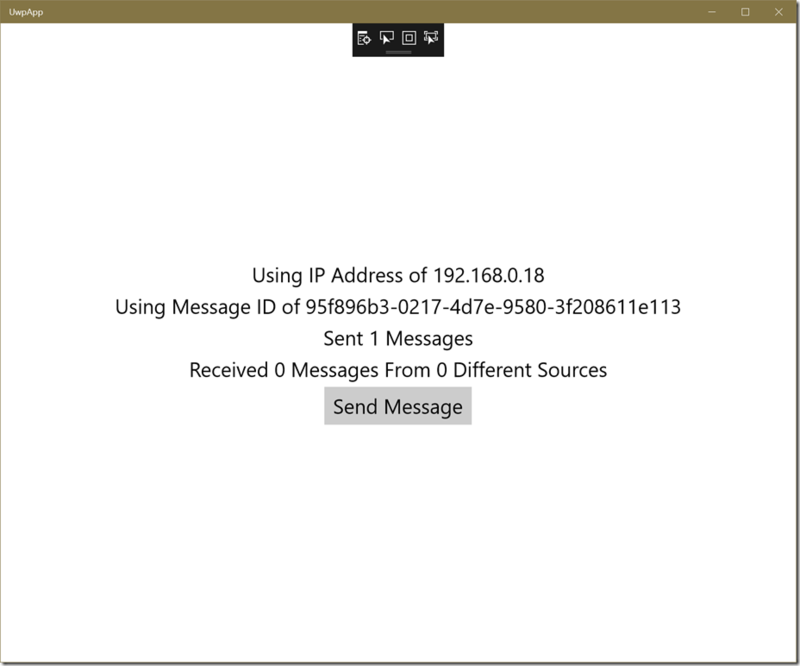 The ability to quickly send messages between HoloLens devices on a common network – examples might be “Hologram has been created” or “Hologram has moved”. I’m assuming that ‘common network’ is ok here and not considering the case when the HoloLens devices are separated by network infrastructure or the internet etc. The ability to send serialized blobs representing HoloLens ‘spatial anchors’ between HoloLens devices on a common network. This is necessary to establish a common co-ordinate system between devices. I think it’s safe to assume that these serialized blobs can easily grow into 1-10MB in size based on my past experiments which can mean that transfers can take some time and also that some networking technologies might not really be appropriate. There are many, many ways in which this can be achieved and some of them appear in the previous posts that I’ve referred to above. I’m going to use UDP multicasting to distribute small network messages to a set of HoloLens devices. 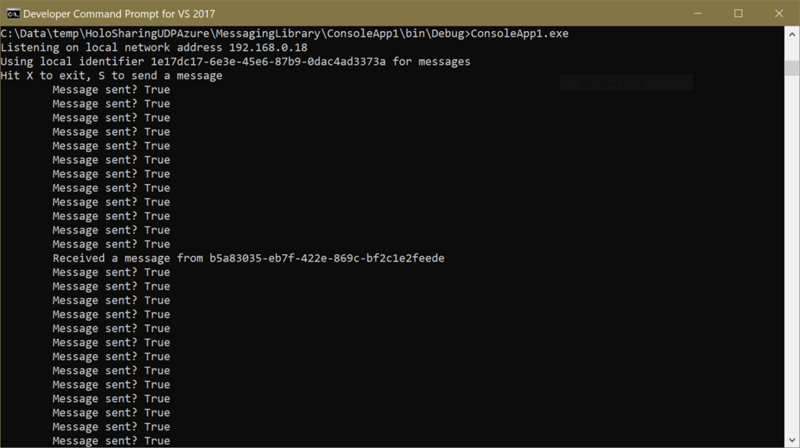 I’m going to use Azure Blob Storage to store serialized spatial anchor blobs. except that I’m taking AllJoyn out of the equation and using UDP multicasting instead. I wrote a quick library for UDP Multicasting of messages and dropped it onto github over here. There’s nothing radical or clever in there, the intention is to multicast send single UDP packet-sized messages around the network making it easy to send them and pick them up again (on different machines, the library doesn’t currently support multiple processes on the same machine). 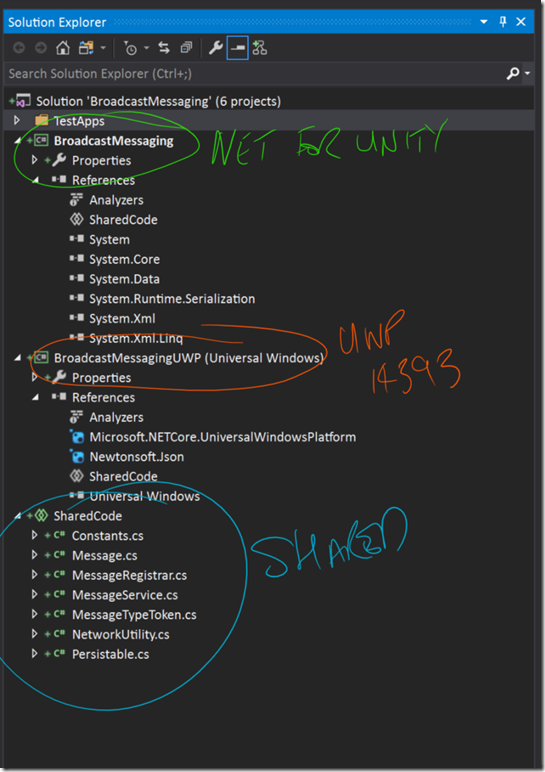 and so the code is 100% in the SharedCode folder referenced from the other 2 projects and at the end of the build process out should pop a library targeting .NET 3.5 for Unity and another targeting UWP. Despite the (bad!) 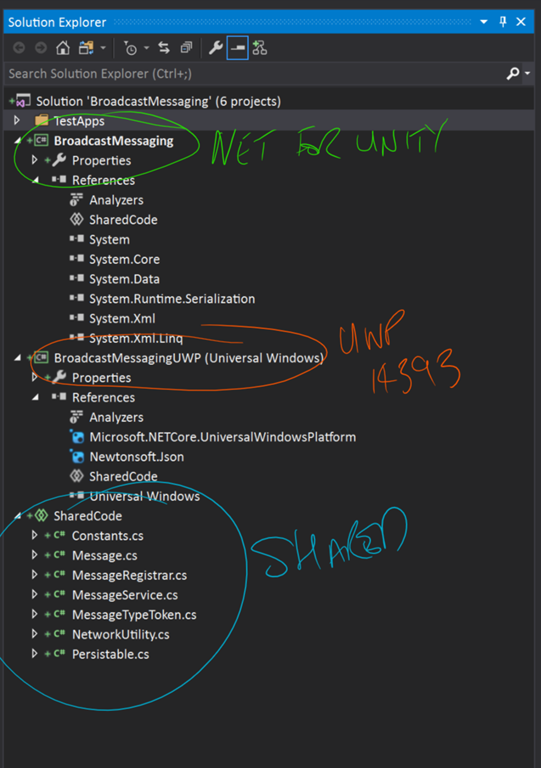 naming of the solutions and projects in the screenshot above, both projects should build a library called BroadcastMessaging.dll and that’s intentional because it will hopefully allow me to use the .NET 3.5 version as a placeholder library for Unity’s editor while the UWP library will be the library actually used at runtime. Unity likes placeholder and replacement libraries to have the same name. 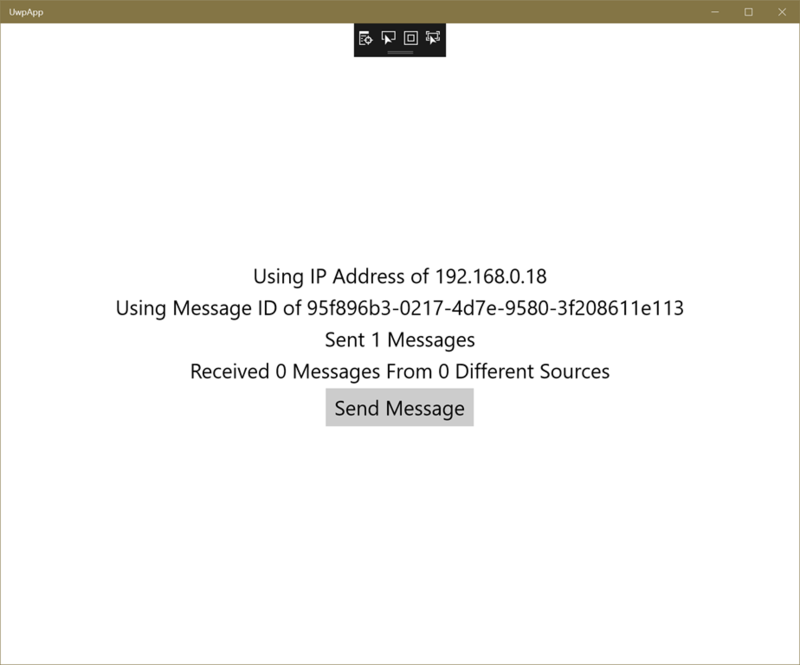 In fact, identification of a message type is done purely by its short, unqualified .NET type name and so MyNamespaceOne.MyMessage and MyNamespaceTwo.MyMessage would be confused by my library so, clearly, it could be a lot more robust than it currently is. and there are extra parameters here to control the multicast address being used (it defaults to 239.0.0.0) and the port being used (it defaults to 49152) and there’s also a need to pass the local IP address on which the UdpClient that this library uses should bind itself to. and the library routine NetworkUtility.GetConnectedIpAddresses takes parameters controlling whether to only consider WiFi networks, whether to rule out networks that appear to be ‘virtual’ and which address family (IP4/6) to consider. I’m sure that this code will have problems on some systems and could be improved but it seems to work reasonably well on the PCs that I’ve tried it on to date. with the callback being an optional part of sending a message. I’ve used callbacks here rather than exposing Task-based asynchronous code because I want the API surface to be the same across .NET Framework 3.51 and UWP clients. For similar reasons, I ended up with some methods taking object based parameters as I struggled with some co/contravariance pieces across the two different .NETs. 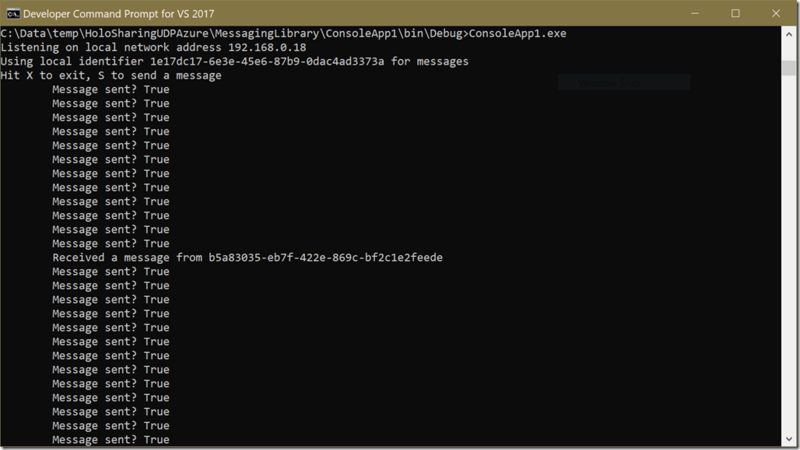 The other projects in the solution here are test apps with one being a .NET Console application targeting 3.5 and a UWP application targeting 14393. Both applications create a GUID to identify themselves and then multicast it over the network, logging when they receive a message from somewhere else on the network. And that’s pretty much it for this post. In the next post, I’ll start to add some code inside of Unity that makes use of this layer and ties it in with Azure blob storage to build up the basics of some shared holograms.